What’s up Buttercup? – Dancing in the rain! 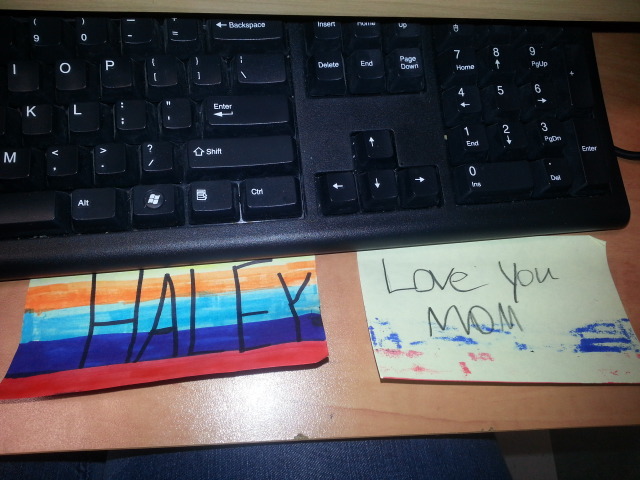 Haley visitied at work last week, I found this when I sat down at my desk the very next morning. It made my day! I am on week two of back to work full-time and so far I am liking it, even more than I thought. I like having a routine but the problem I am having is trying to fit everything in. With the kids having activities 4-5 days a week something has to give and usually it is housework. At 9 p.m. after I have ran around all day it is easier to close the laundry room door then to actually do laundry. When I decided to go back to work I went through mixed emotions and I even cried my eyes out at one point. I think the thing that bothers me the most is thinking of the summer and not being able to drop everything and go to the mountains whenever the mood strikes us. There were times Kirk and I would decide to go to the Mountains at 3 am, go to bed till 7 am, wake the kids, tell them the news, pack a couple of bags and drive. I love those crazy, random, spur of the moment trips. I do however like feeling useful and feeling like all the hours in my day are accounted for. I would like to have just a couple of extra ones that are not accounted for though, a couple of freebies. I also miss aquafit, coffee dates and p.j days. Today my 9-year-old daughter called me at work crying to tell me that her older sister had eaten all the drumsticks and she didn’t get to have one. I was in the middle of entering schedules into the computer and though it wasn’t time sensitive in my head I had started it and didn’t want to leave it unfinished. I had five minutes to get everything I wanted done so I could chat with my evening staff, pack up and pick up my daughters friend and both my girls and get them to practice on time. This ice cream crisis did not constitute an emergency in my mind and it was a good opportunity to discuss when we call mommy at work and when we don’t. Truth be known if they are just calling to say I love you they can call anytime. I rushed to practice, I brought the youngest home after hers and left the oldest to her two hour practice while I quickly cleaned the kitchen and folded laundry. I found myself staring into space after I inhaled a chicken sandwich and coleslaw and thought it was a good opportunity for an update. I HAD FIVE WHOLE MINUTES TO MYSELF!! It’s -22 and I am bundling up to go back into the cold and get my oldest daughter from her roller derby practice. The fun it never ends.